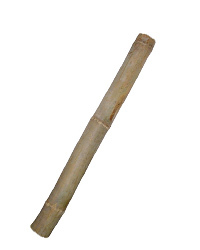 Bamboo sticks are a great natural product to decorate your pet reptiles vivarium with. These natural bamboo sticks when hollowed or drilled make excellent hiding and breeding spots for some arboreal geckos and amphibians. Natural bamboo stocks can be used in large reptile enclosures and vivariums to create perching and basking spots, species such as iguanas and water dragons would make great use of these.